Really appreciate the clear level of experience shown by the entire team at Bright Smiles in working with children. They make the trip to the dentist fun and something to which our girls already look forward. And the personal attention and genuine care and concern shown by Dr. Bright is second to none. Thankful we found such a great pediatric dental practice. In our year and a half of going to Dr. Bright we had one dental emergency, they accommodated us the same day. Dr. Bright was so helpful as I was very nervous due to us traveling that week. They even followed up to check on my son. Anytime we are there we never feel rushed or like another appointment that day, Dr. Bright and his staff are always attentive and professional. We are back for our second appointment and absolutely adore this place! It's nice, clean, the staff is amazing and Dr. Bright is so good with the kids! My 10 year old loves coming here!!! You won't be disappointed! This was son's first dental visit. Everyone in the office was very nice and patient. I did not feel rushed and my son had a great first experience with the dentist. Thank you!!! Very kid friendly and kid focused--from the music to the toy jar to the welcome sign. Very clean and comfortable. My son, aged 3, gave everybody a hard time during his cleaning, but the staff did a good job working around his freak-out session, and after it was all over, he didn't want to leave because of the toys in the waiting room. Very clean facility. Staff is super friendly. Dr Bright is down to earth. All are great with kids! Great experience! Wonderful service! By far the cleanest dental office I have ever stepped foot in. Made my children and myself feel very welcomed! I wish I would have had a dentist like this growing up! My kids definitely needed this because they have had some horrible experiences in the past. Will be returning soon! Always a great experience. Dr. Bright is awesome with my two year old. Some people just have a good knack for dealing with kids, Dr. Bright definitely has it. Great location. If you are looking for a dentistry that is extremely kid friendly and amazing dentists that get the job done gently and quick, consider going to this office. Dr. Bright is a wonderful doctor and he know what he is doing and the staff provide PERFECT customer service. Your children are most definitely in GREAT hands here. Have you noticed that your child is experiencing some sort of dental pain? It’s possible that decay or an infection has gotten into the nerve of one of their teeth. If that’s the case, they may need pulp therapy, which is like a root canal for baby teeth. Don’t let the phrase “root canal” frighten you! The whole goal of pulp therapy is to treat and save an infected baby tooth so your child can be pain-free again — and so they don’t have to lose that tooth prematurely. Does your child complain about tooth pain or experience tooth pain at night? Does your child feel tooth sensitivity when eating or drinking something particularly hot or cold? Have you seen any swelling or redness around one of their teeth? If you notice any of these, we recommend that you contact Bright Smiles Pediatric Dentistry so we can bring you and your child in for a consultation with Dr. Bright. He’ll complete an exam to see what next steps if any should be taken. Pulp therapy sometimes also goes by the name of pulpotomy or pulpectomy, but there is a slight difference between the two. A pulpotomy is when the inner pulp of a tooth has become damaged, but the infection hasn’t spread to the actual pulp root yet. During a pulpotomy, we’ll only remove the affected areas. A pulpectomy becomes necessary when the entire tooth pulp including the roots have become infected. During this procedure, we go a couple steps further by also cleaning out the root canals and placing a dental crown on top to strengthen the tooth. Why bother with pulp therapy on a baby tooth if it’ll just fall out eventually? Great question! Just because baby teeth eventually get replaced by permanent teeth doesn’t mean they aren’t important. They actually serve many purposes, including guiding proper tooth development which in turn helps with proper chewing and speech development. Not to mention that baby teeth can still get cavities and affect your child’s overall oral health. When performing pulp therapy, we always numb the treatment area to prevent discomfort. Bright Smiles Pediatric Dentistry also offers sedation options if you think one will help soothe your child. We have nitrous oxide (laughing gas), oral conscious sedation, valium sedation, and in-office IV sedation performed by a licensed anesthesiologist. Your child’s comfort and safety are always our priorities, and we’re happy to go over which sedation technique might be best for your child. What happens if we don’t get pulp therapy? If your child doesn’t receive pulp therapy when they need it, it’s possible that they’ll lose that tooth or have to get it extracted prematurely. When that happens, it could affect how other teeth grow in or cause them to shift into the open space, both of which can affect your child’s bite and the appearance of their smile. Complete the form below to take the first step in your child’s pediatric dental care and we’ll call you back as soon as possible. Now open and accepting new patients throughout the communities of St. Johns including Julington Creek, Nocatee, Ponte Vedra Beach, Palm Valley, Fruit Cove, Palencia and St. Augustine as well as the greater Jacksonville area. 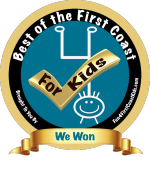 Thank you for voting us Best of the First Coast!